Couscous (pronounced "KOOS-koos") is a dish made from tiny granules of durum wheat. The couscous grains are then prepared by steaming them until they have a light, fluffy consistency. 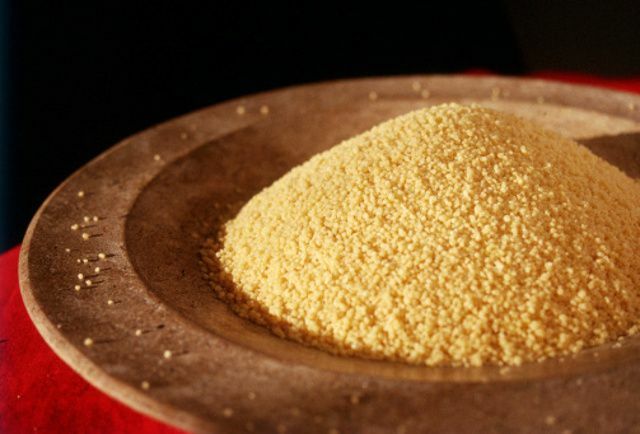 Couscous is closely related to pasta, as durum wheat, ground into semolina flour is the same type of wheat that is most commonly used for making pasta. In fact, technically couscous is a form of pasta, with one main difference: while pasta is made from wheat flour (i.e. wheat that has been finely ground), mixed with water and formed into shapes. Couscous, on the other hand, consists of durum wheat that is crushed into granules. Couscous originated in North Africa, where it is traditionally prepared as part of a meat or vegetable stew seasoned with cumin. Today, couscous is found in many cuisines, including much of the Middle East and various Mediterranean cuisines, as well as the United States and western European countries such as France and the U.K. The traditional technique for preparing couscous involves steaming the granules multiple times in a tall pot called a couscousière. But these implements are expensive, bulky and hard to find. For a beginner, instant couscous is much easier to make and requires only an ordinary pot with a lid. Indeed, most commercially available couscous is an instant form which has been steamed and then dried. Preparing this form of couscous is relatively foolproof—the dried couscous is added to a pot of boiling water or stock, the pot is then covered and the water is absorbed into the couscous in about five minutes. An important factor to note is that while most boxed couscous available in North America is the instant variety, you might run across traditional couscous, which takes longer to cook and involves boiling the couscous in much the same way you would prepare rice. This method takes practice, with the major pitfall being that it is easy to overcook the couscous, which results in it turning out gummy. Israeli couscous is a variation on the traditional couscous which is made of larger, smoother, spherical granules. Israeli couscous has a slightly chewier texture than regular couscous. It also takes longer to cook. But because it's bigger, it is less likely to turn gummy, and you can even cook it using the pilaf method, which involves sautéeing the couscous in oil to brown it slightly before adding the cooking liquid. There are any number of couscous recipes that are essentially variations on this technique, and they can be savory or slightly sweet, depending on the ingredients that are added. It can be prepared with lemon, toasted almonds, peas, raisins, currants or other dried fruits, even apples or apricots. When serving couscous, it's sometimes customary to mold it into shapes by pressing it into small bowls, then inverting onto the serving dish before unmolding. Couscous is also frequently used in salads, in which case it is cooked and then cooled and chilled before combining with the other ingredients. And for a real treat, you can also prepare sweet couscous, either as a dessert or even breakfast, using milk as part or all of the cooking liquid, much like you would prepare oatmeal.